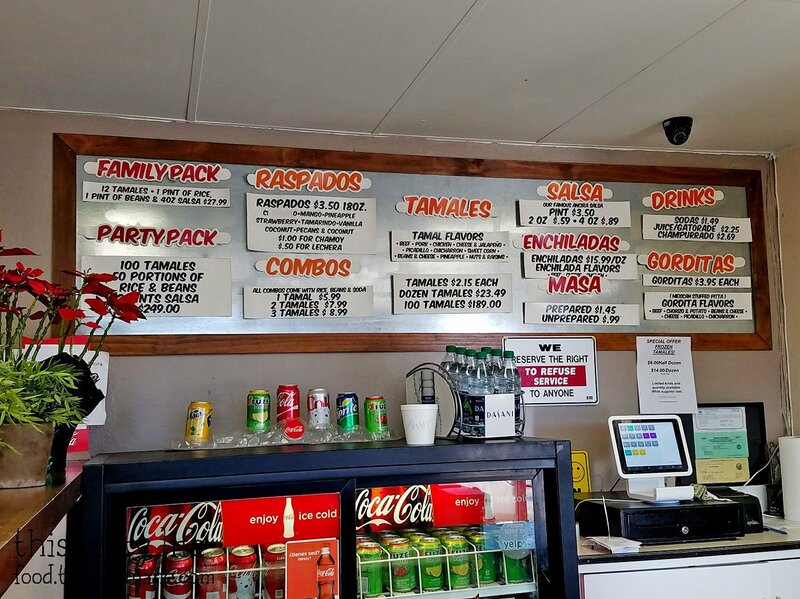 The last time we came to Tamales Ancira was to try the tamales back in 2015. 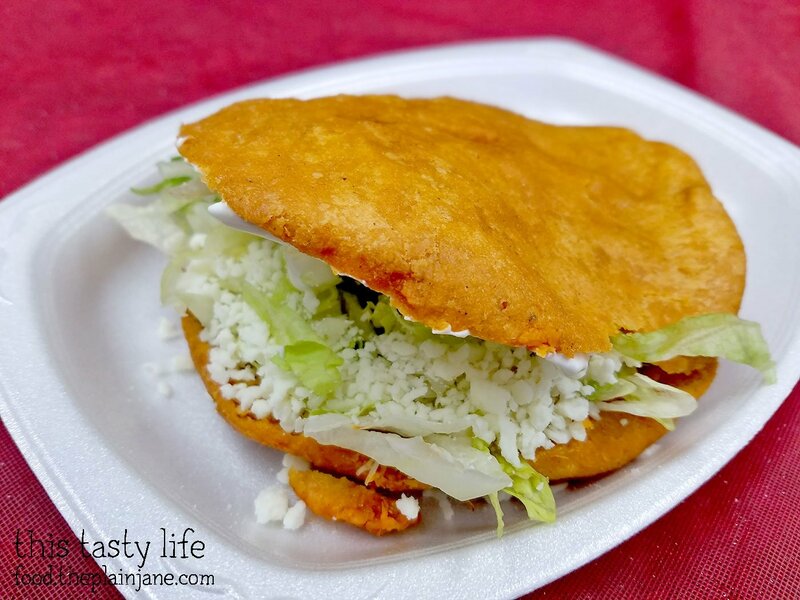 We had always tried to get the gorditas (as referenced in my post) but the lady who made the gorditas didn’t work on the weekends they were usually sold out by the time we could get down there on a Friday. I’m happy to report the stars finally aligned for us last week and we were able to get those gorditas! The gorditas have gone up in price by a dollar but they’re still only $3.95. The price of tamales have also gone up to $2.15 (previously the price was $1.99). 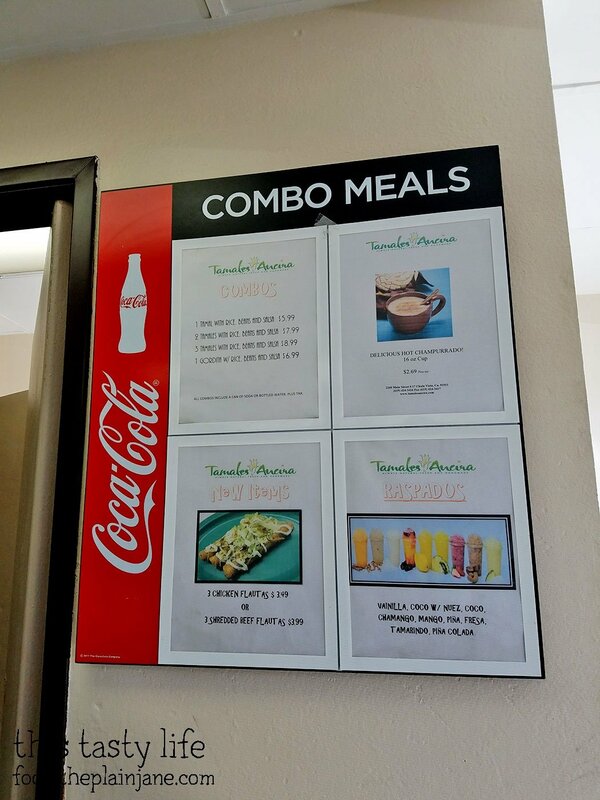 Here’s a look at the combo menu at Tamales Ancira. They also now have flautas. Jake and I were here for the Gorditas [$3.95]. We got two of them and shared. We asked for both “con todo” (with everything) which included lettuce, cheese, and sour cream. The outer shell is made out of masa and I believe these are fried. They were served to us piping hot and stuffed with our choice of filling and toppings. It’s sort of like a masa pita pocket! 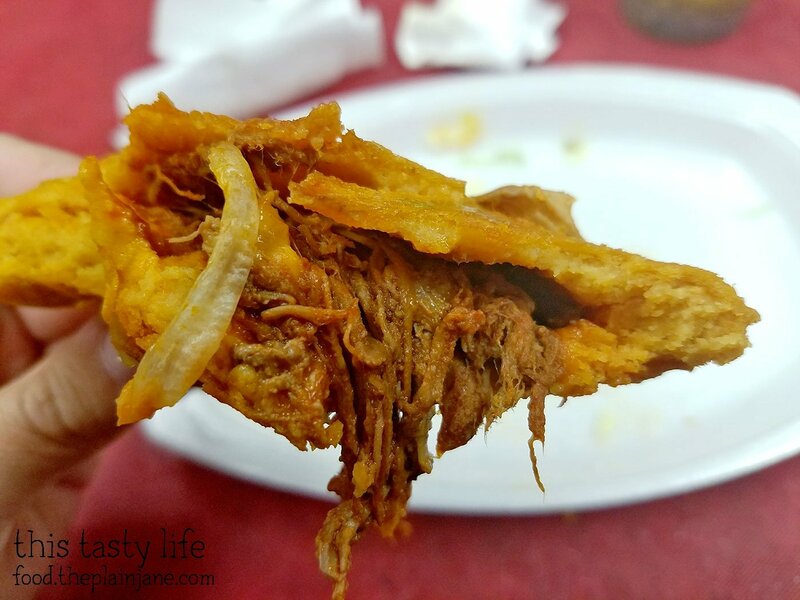 The filling is stuffed into the back of the gordita. I wish there was a way to properly mix the toppings with the filling so you would get them together. When we ate through the gorditas, we ate the first half with all of the toppings and didn’t get to the filling until we were almost halfway through. I’d almost ask for the lettuce on the side or something so there could be more even distribution. No matter – it was still delicious despite the lettuce hurdle. Here’s the halfway point of the beef filled gordita. The masa on this is wonderful. 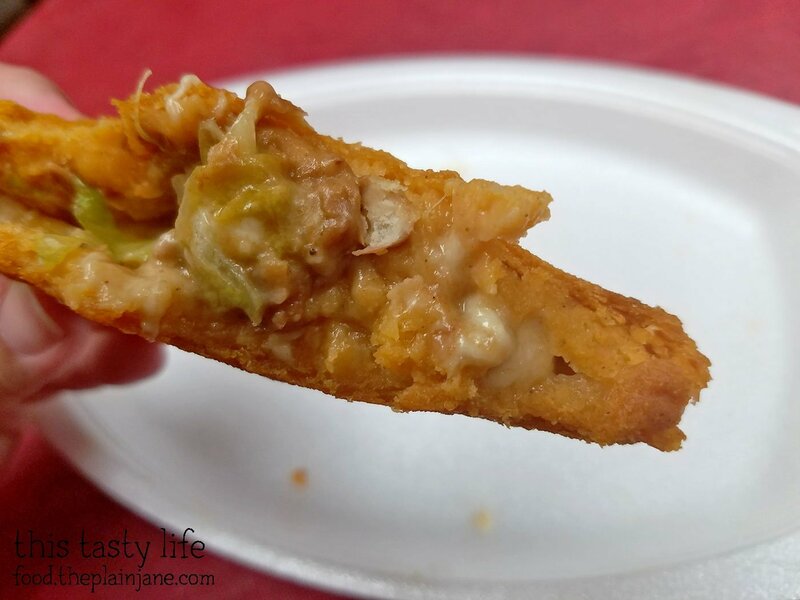 It has the same flavor as a tamale, but it’s fried. 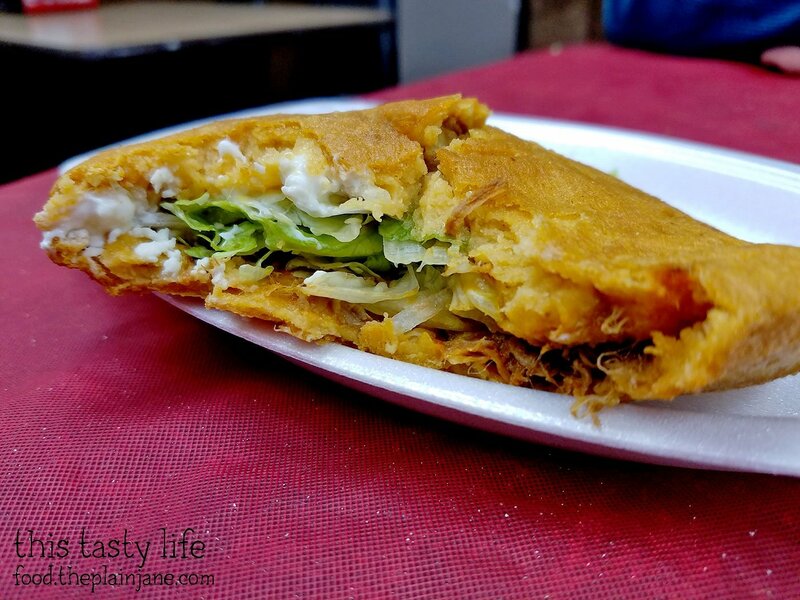 It creates this crunchy pocket that still has some of the moisture of a tamale. The shredded beef filling is in a red sauce. It was moist and the meat was juicy. It was quite flavorful and we both really enjoyed this one. The second gordita we choose was filled with bean and cheese. In retrospect, I would have just wanted cheese since I didn’t enjoy the flavor of the beans. Jake liked it well enough but I only liked the cheesy bits. 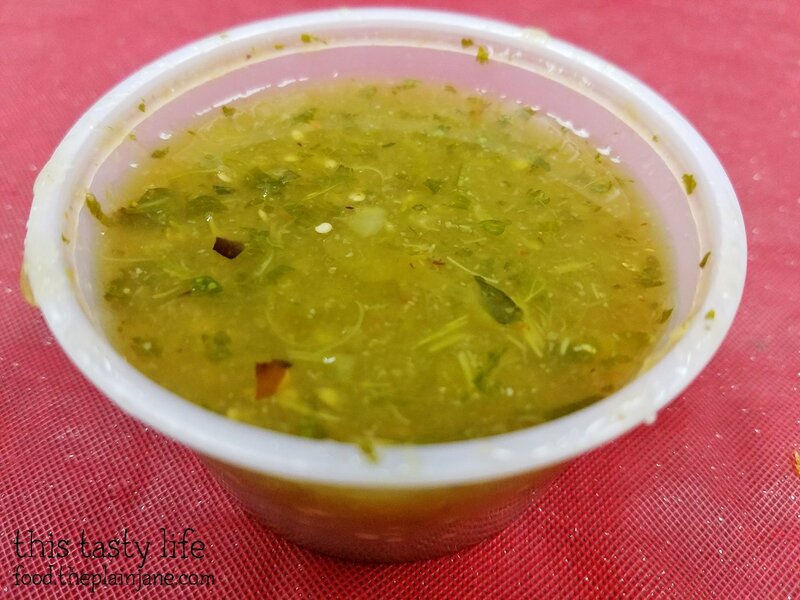 The only have one kind of salsa here and it’s this green salsa. It reminds me of a chimichurri sauce since it’s got a ton of herbs in it. Jake doesn’t really like this salsa but I like it! It gives the food a punch of flavor! If you want to try a gordita, you’ll have to get down here during the weekdays. We didn’t ask if they’re available on the weekends but you can FOR SURE get them during the week. Thanks to my (final) furlough day last Friday we got to finally try these. Hooray! I’ve never had a gordita before. I’m sure these are different from the Taco Bell version. The beef one looked really good and I am intrigued by the crunchy masa shell. I would prefer that to soft and mush masa. 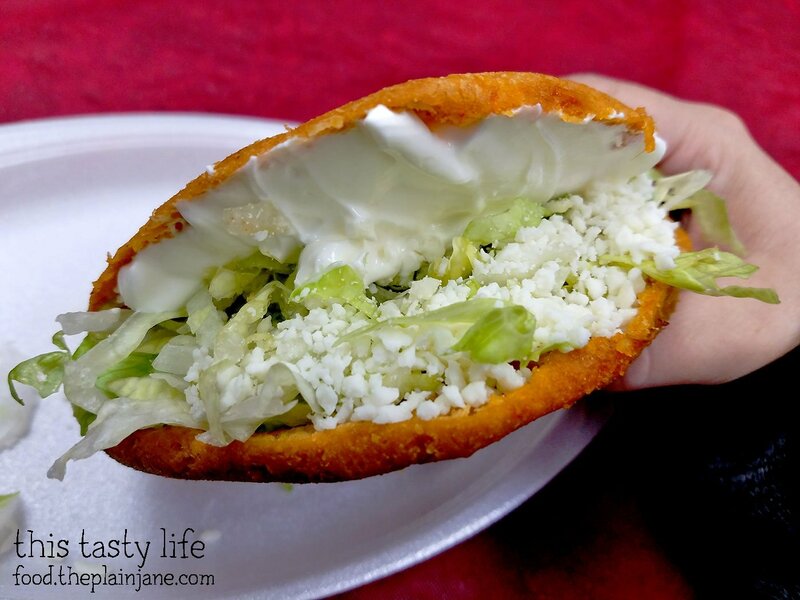 Hi CC – I’ve seen photos of the gordita at Taco Bell – it doesn’t look anything like this one!! Yeah, I think you’d prefer this shell – there’s nothing mushy about it!